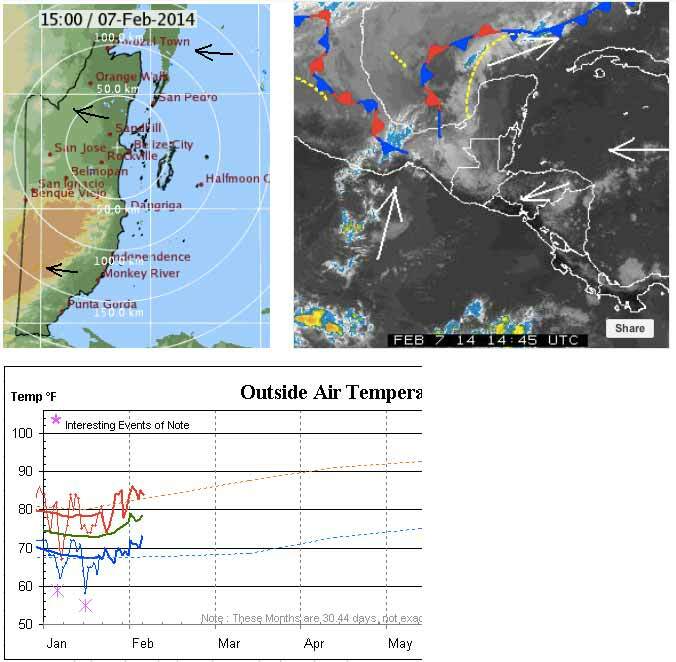 Belize NMS: East to northeasterly airflow dominates the weather. 24-hour forecast: Cloudy at times today and partly cloudy tonight. A few showers will affect the country today, becoming isolated tonight. Today: Winds: E/NE 5-15 kt. ; seas: Choppy. ; waves: 2-4 ft.; a few showers. Marine Outlook: Saturday night:- Winds: E/NE 5-15 kt. ; seas: Choppy. ; waves:2-4 ft.; showers increasing. General Outlook: (Saturday): Partly cloudy skies with isolated showers. On Ambergris Caye this morning the expected high is 85 with a calm sea and clear sky. Not a lot happening at present. . .. Light Easterly air from the Caribbean, with little cloud appearing in it. The SW Pacific air flow is fairly fast, but not near Belize at present. . .Remember the Blue and Orange Clouds are higher, above the surface hugging Caribbean air, so they can appear to be on top of each other sometimes. There are a few, very few, small isolated Rain showers in any part of the country, but very few. . More Sun as the heat builds up. The Red and Blue Dotted lines are the Typical average max and min Temperatures. As you can see the Real Temperatures are already climbing up, even above the typical. But we may well see some more Cold fronts, that can bring these trends down later. Cold fronts can continue right up into April. ...Then again, we might not see any more Cold fronts. Great Picture even got the bird flying.